Spring is just around the corner! 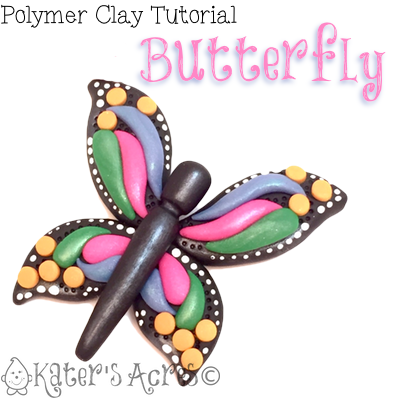 This polymer clay butterfly tutorial can be used as a starting point for pendants, brooches, or even barrettes! Use your imagination and get started creating. This month in Parker’s Clay Tribe, our Swap theme is “Butterflies.” Many of the members have asked for a tutorial on how to make a butterfly. If you would like to get involved in a polymer clay swap, read this article here. Today’s free content is brought to you by Parker’s Clayful Tutorials Club. First roll back clay on the 2nd largest setting of your pasta machine. Cut 4, 1″ rounds from the sheet. Take two of the rounds and cut 1/3 off. Roll each section into an elongated teardrop shape. Curve each end outward slightly. Place in an “x” pattern as shown. Place an acrylic block over the top and press gently smashing the shape, but not flattening it. Your butterfly should be about 1/4″ thick. Remove the block and use your fingers to reshape any necessary areas. Let’s choose the colors for your butterfly. Learn how to make your own colors here. Learn how to make a coordinating color palette here. Decorate your butterfly in whatever colors you have chosen. I decorated my butterfly in a sort of textile pattern. You want your patterns to be similar for your wings, but not identical. Notice how my bottom wings echo my top wings, but have a different pattern and orientation to the design. Add some “dots” around the edges of your wings using another color of clay. Add the center body using the 1/3 sections you cut off of your rounds at the beginning. Simply roll the sections into a log with a tapered end. Place in the center of your wings. If you would like, you can add details with a dotting tool. Don’t forget to add additional details with mica powders for shimmer and chalks for depth. Once your butterfly is baked, add any additional details with acrylic paints and a small brush.